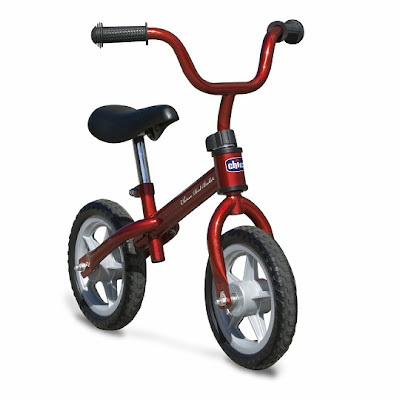 We bought jj a balance bike for Christmas (it was $30 at Costco but I don't know if they are selling them now for some reason). Have you heard of them? They look like regular bikes but don't have any pedals, so your kid learns how to balance without having to worry about pedaling. jj rides his pretty regularly, sometimes to the park, most of the time just around our backyard. At first he didn't seem to like it much and fell over a lot, but then he started being able to go pretty fast while keeping his feet off the ground. Today while at his friend Liam's house, he hopped on Liam's real bike and was able to ride it all by himself from that moment on, without any help or training. He didn't have any accidents, even riding on a downhill slope. He loved it! Yay! I guess this also goes to show that you never know what your kid can do until you let him try. Go JJ! He is growing up so fast! I can't wait to see you all in April! Wow, good to know! We were going to get D a tricycle for her b-day this year but maybe we'll do this instead? Joshie must have really good natural balance!!! Amazing! His world just got bigger. He's SO coordinated! That is so cute! And he's AWESOME at it! Sweet! I've always wanted to get one of those. Who knew they could be so affordable?